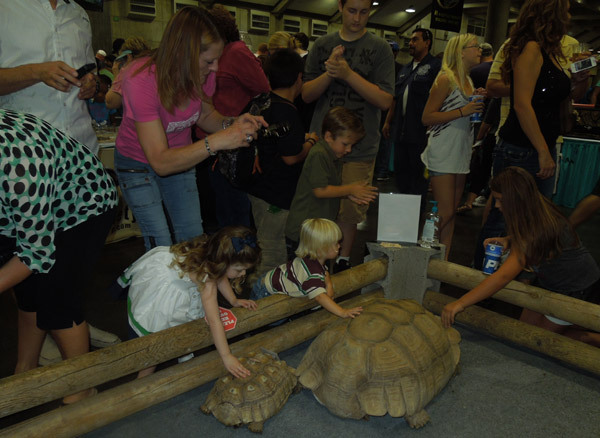 I brought my kids to a big reptile show in Sacramento last weekend. Shows like this are really odd events, they are just marketplaces with a bunch of vendors set up in a convention center. 40 snake vendors? This sounded like it would be worth seeing. I was sure to inform my kids before we went that we were not going to buy a pet. We were just going to check out what was available. They understood. 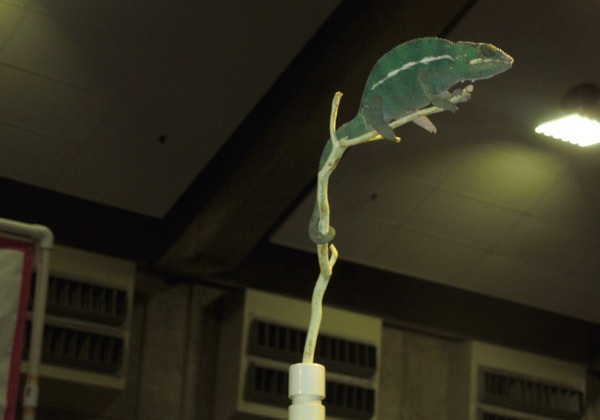 I think they want a dog most of all, but I figured it would be best to erect some defenses before we went into the heart of the reptilian sales floor. We parked on the street at a meter with two hour parking. This was partly a strategy for establishing an exit time. On the way into the show, we spotted a bunch of kids marching out with lizard and alligator stuffed animals. I began to realize that I should have girded against all purchases, not just actual live pets. At the entrance we were referred to the box office to buy tickets. 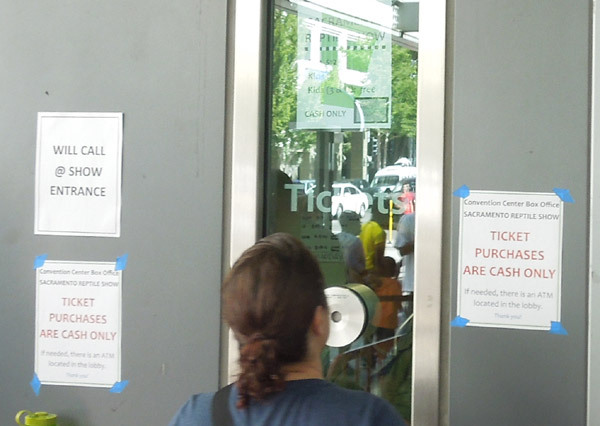 The box office at the Sacramento convention center only accepted cash for some reason. What the hell? Luckily I had cash, because non-cash holders were being referred to an ATM machine with the world's longest line. 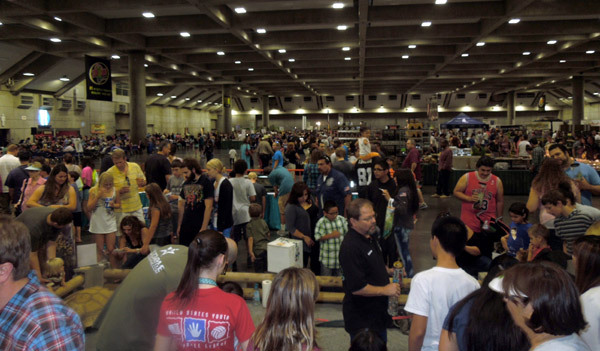 Inside the show was a convention floor with a ton of reptile vendors. 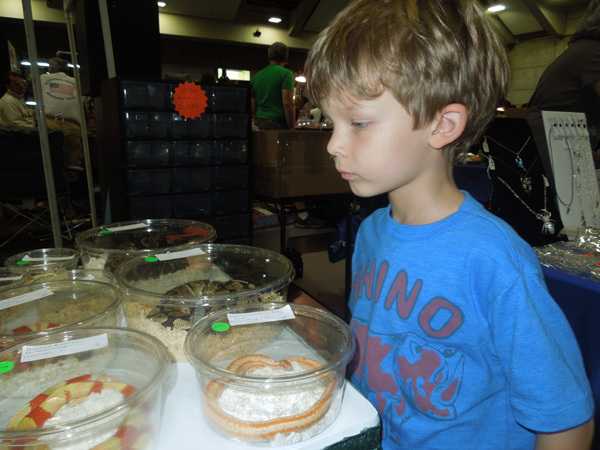 One of the first was a vendor with a wide variety of giant mealworms. They were selling them in clear plastic containers, about the size of a single layer cake. There were hundreds of them, all wriggling with grossness. We were off to a great start. 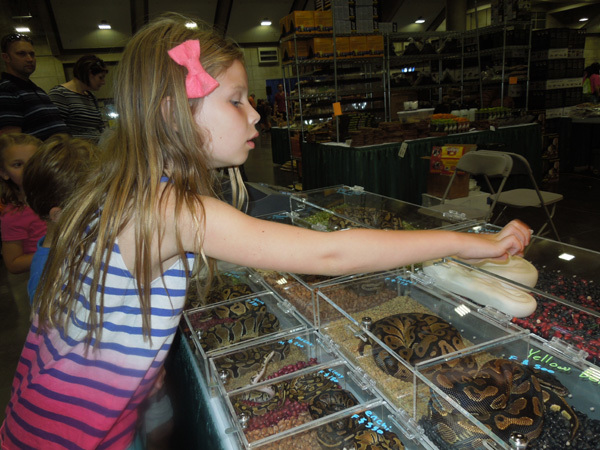 Before long we were looking at tons of snakes and lizards for sale. 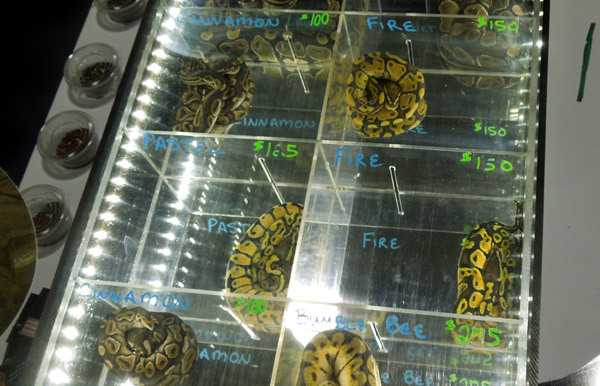 Snakes were priced from about $40 to maybe $360. 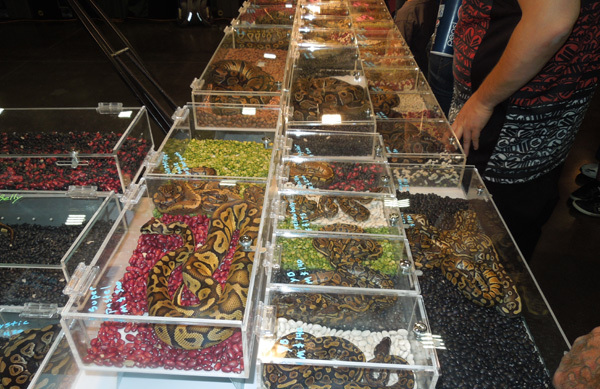 I didn't see a direct relationship between what I consider attractive snakes and high prices. I guess I don't know enough about reptiles to know what is rare or desirable. Giant tortoises. We also saw little silver-dollar turtles for sale. 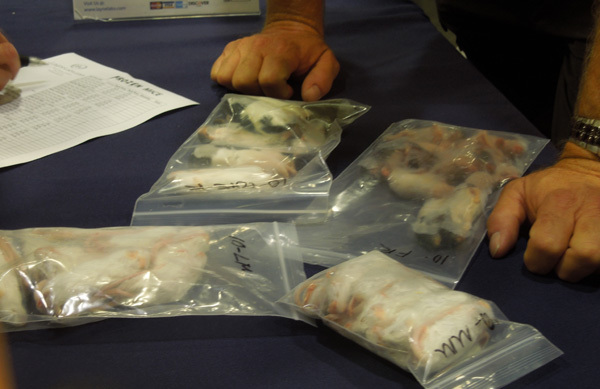 Frozen mice. We also saw crickets for sale as food. I thought these were great, but the kids didn't care for them. Probably too spicy. My kids talked me into buying souvenirs. They found some reptile-related jewelry. 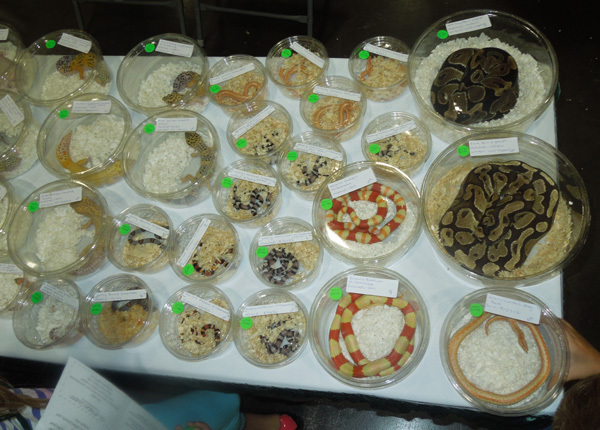 I really liked the display technique of presenting the snakes in a transparent plastic box with dry beans or kernels. They looked really cool and clean. A pile of gold coins would look good too. My kids with a giant boa, of the non-feathered variety. Wouldn't this make an elegant velvet cord for line control? 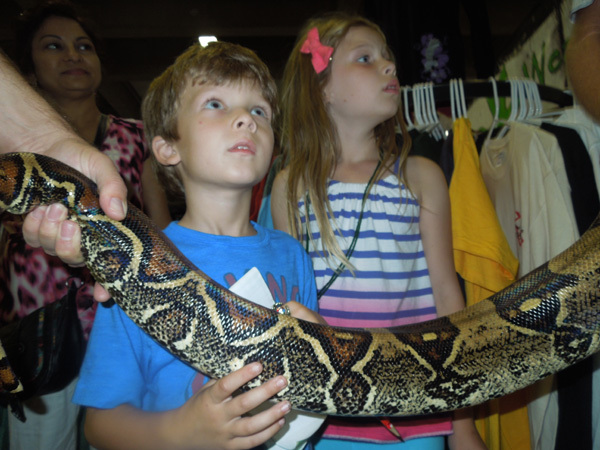 I wonder what I would have done if this snake had begun crushing one of my kids. Implore the crowd to "help me straighten the snake? ", cut the snake in half with a knife, I guess? 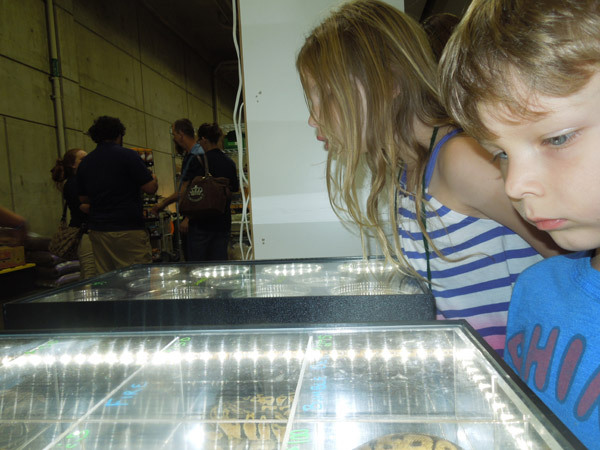 We had a blast at the snake show, it was like visiting a garage sale at the zoo.